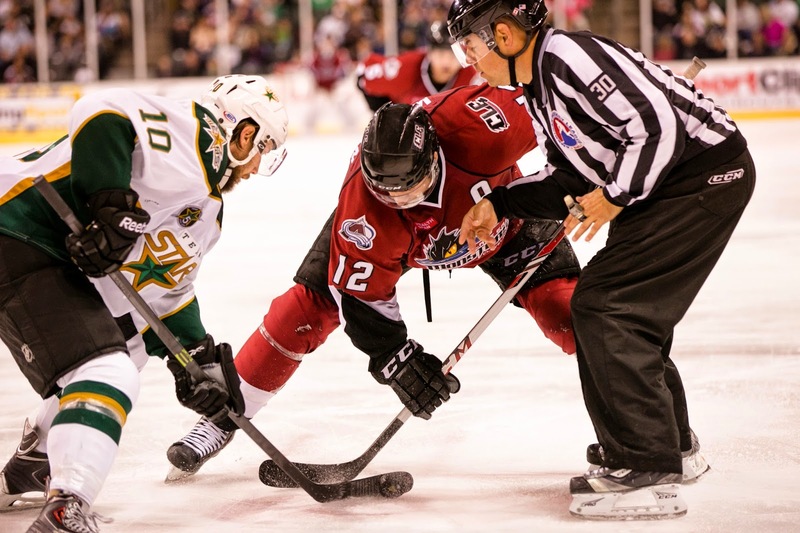 Looking for their ninth straight win, it was more of the same out of the lineup of Mike Hedden, Justin Dowling and Brett Ritchie tonight against the Lake Erie Monsters. That line combined for five points on the night in a 4-1 victory. All three players extended point streaks in the win. Brett Ritchie picked up points in his seventh straight game. He has seven goals and six assists in that time. Mike Hedden and Justin Dowling put their streaks at six and five games, respectively in the win. Additionally, Dowling and Hedden moved to plus-19 and plus-18 on the season. Dowling's total ties him with Patrik Nemeth for the team lead. The win also pushed Texas to 99 points on the season, tying a franchise record set in the inaugural season. It put them one point ahead of the Manchester Monarchs for the league lead with five games to go and one in hand over the Monarchs. Cristopher Nilstorp picked up first star honors with 30 saves on 31 shots in the contest. Almost as an afterthought, Travis Morin picked up his 81st point of the year. Texas was an impressive 8-for-8 on the PK and is now 30-for-32 on the current win streak. A scoreless first gave way to a solid second for Texas. The Stars opened the scoring with Jyrki Jokipakka's fifth of the year, this one at 4-on-4. The pass from the slot beat Aittokallio stick-side for the 1-0 lead. Mark van der Gulik tied it right back up with a pass off a rebound shot. The Texas power play engaged with JT Wyman in the box for delay of game. Scott Glennie was the beneficiary of a neat backhand pass by Curtis McKenzie, which he one-timed into the net. It was the eventual game-winner. The Stars added two more in the last few minutes of the third period after some physicality in front of the net led to two roughing penalty calls on goalie Cristopher Nilstorp. The Swede now has ten penalty minutes on the season. Brett Ritchie scored his fifth of the weekend with yet another cross-goal effort. Justin Dowling added a shorthanded tally into an empty net with 65 seconds remaining in regulation. Texas are 6-0 so far on their homestand and have a chance to make it 7-0 on Friday against San Antonio. The club has four days off between now and then. It's the perfect time in the schedule for long breaks like this, given the Stars' difficulties in last year's playoffs with injuries. Do you know why Fortunus was scratched? For Mueller, I figured he probably hadn't made it back from Dallas or just needed a rest after being on I-35 for the last week. The new guys looked pretty good, though. Glad to see them getting ice time and learning the ropes. Just rotating scratches around. If you have guys like Klingberg who can jump in, why not give a big part of your playoff run a game off when you can? So I guess it's safe to say Nilstorp now has the most PIM of a Texas Star goalie? Also, I have been impressed with Oleksiak's play recently. He looks more solid on the ice now than at the beginning of the year. I also don't understand how Dallas called up Mueller today and then almost immediately sent him back. Did he even get out of Austin? Considering the team was playing in Florida, he would have had to fly both ways. Sometimes I just can't figure out what the big boys are doing!!! !